Conor Morey-Barrett discovers a snuggery in Providence, Rhode Island. Providence is a unique city, capable of eliciting visions from the works of HP Lovecraft or the absurdist verse of David Byrne. Similarly, there are many excellent dining options off the beaten path in Providence. One such place is the Duck & Bunny, a self-described snuggery. Husband and wife owners Daniel and Jessica Becker, decided to call their establishment a snuggery (which means “a cozy and comfortable place”) when trying to find the right description for the perfect blend of restaurant, teashop and bar. 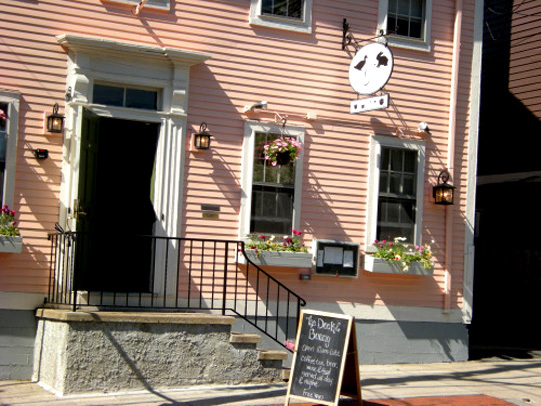 The Duck & Bunny is located within a pink Colonial house and while the exterior of the restaurant signifies Yankee New England, their signature dishes are crêpes. The layout of the restaurant is quite whimsical. 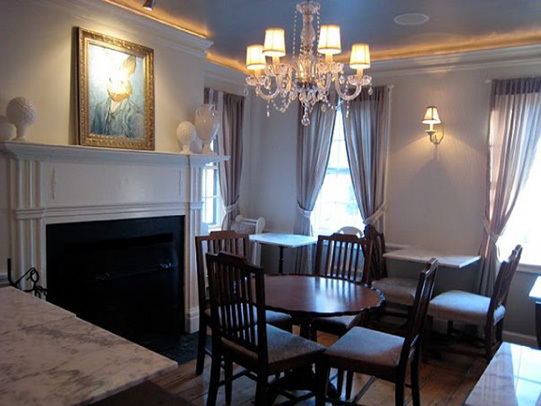 Instead of a main dining room, the restaurant is divided into separate rooms, reminiscent of the origins of the Colonial house in which it’s located. There is a cafe counter where they serve delectable cupcakes which is another of their specialties (mini cupcakes cost $1.25 and maxi $2.75). Additionally there is a bar room (which serves wine and beer), the tea room (a very wide selection of teas are available for $3-4 per pot) and backyard seating in the English Garden. The crowning touch to the decor is the artwork which adorns the walls. Replicas of famous works of art are featured with the unique twist of a duck or rabbit (or both) standing in for the traditional subject matter. I took my dinner in the tea room, near a window overlooking Wickenden Street. For an appetizer, my friend and I shared the bacon wrapped dates, accompanied by a honey-balsamic glaze ($8). These were just the right size and with a perfect balance between sweet and salty. For an entrée, I had the T.S. Geller; a roast beef crêpe with cheddar, caramelized onions and a homemade horseradish cream ($12). It paired excellently with the suggested glass of Colle del Sole Rosso Piceno. The Duck & Bunny is wonderful contribution to the culinary options of Providence, whether you want afternoon tea, a drink after work or dinner.